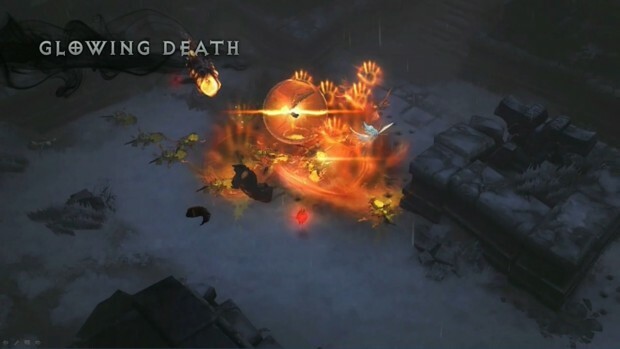 It is time for the first Diablo III panel game at BlizzCon 2014. 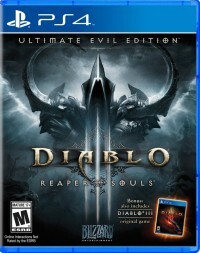 It will feature Diablo III game director Josh Mosqueira, lead designer Kevin Martens, senior technical designer Wyatt Cheng, and senior game designer Jonny Ebbert. 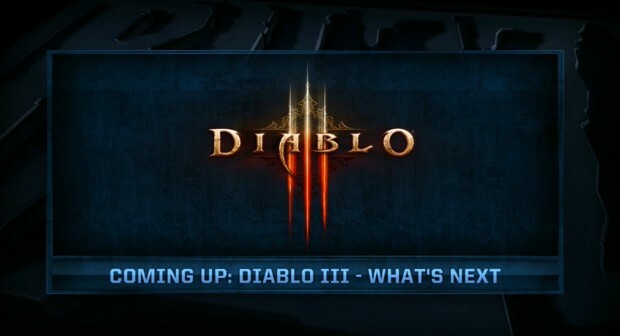 They will be discussing the features and concepts that are in the works for future Diablo III patches. We will be covering it all in this liveblog. Let's hear what they have to say! 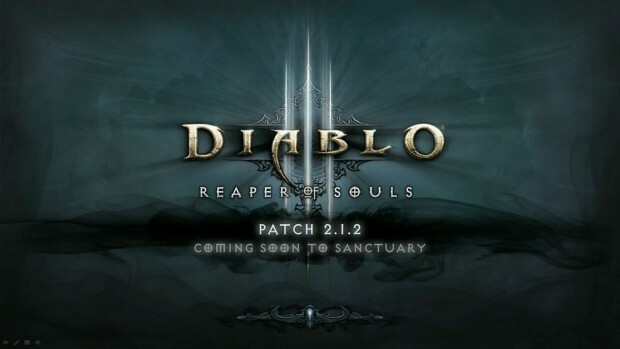 2:15PM Pacific Time - Josh Mosqueira is out, giving a recap of what's happened over the last year in Diablo III. 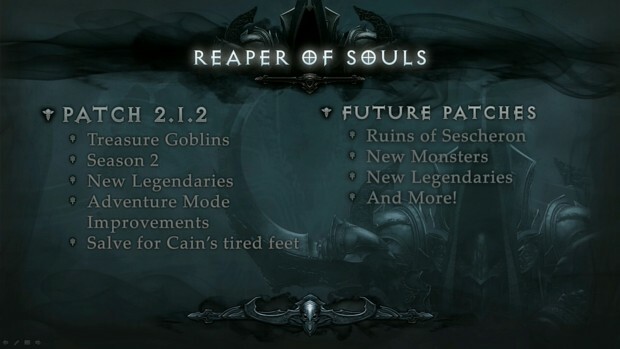 2:17 - He will be talking about what's new with Greater Rifts, a new area to explore, and what will be in the next patch, 2.1.2. First up are the Treasure Goblins, showing the current types of goblins. The base Treasure Goblin was expanded with the Realm of Greed. 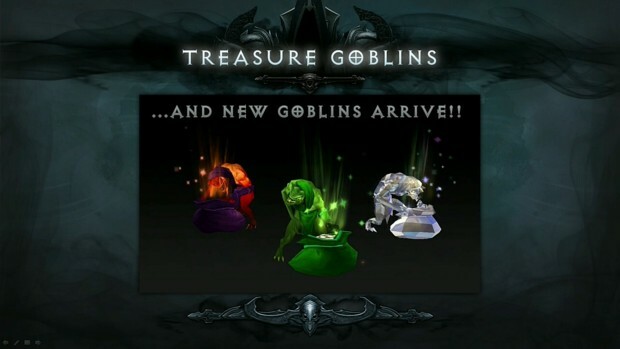 Right now there are four old types of Treasure Goblins, now there are three new Goblins! 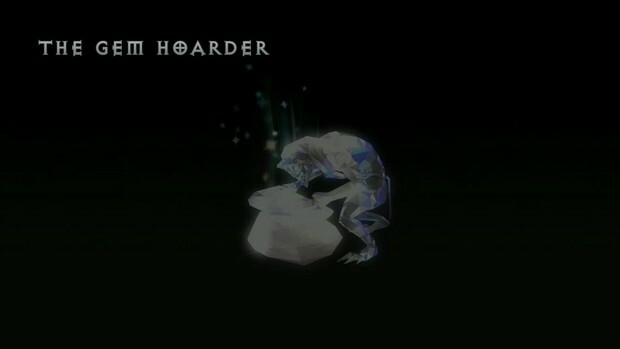 The first one is the Gem Hoarder, and every time you hit him, gems will drop. When you kill him, it's a gem explosion. 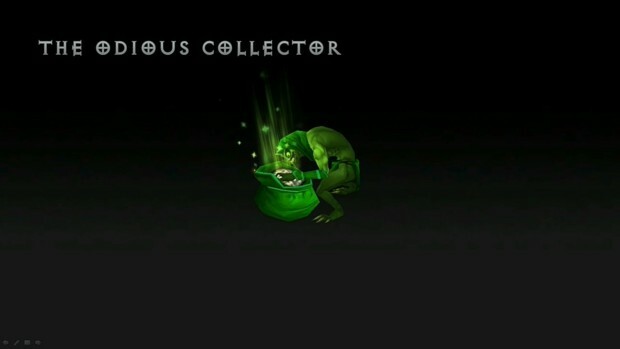 2:20 - The next one is the Odious Collector, who drops crafting materials and patterns. 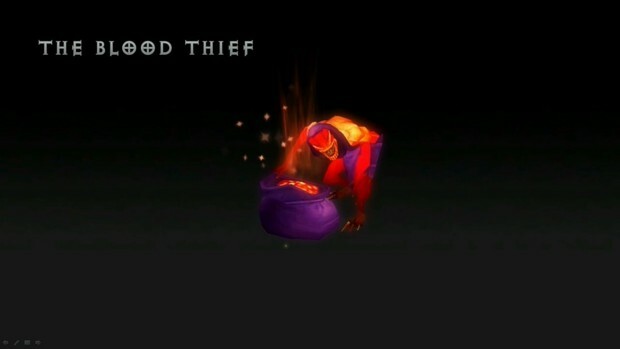 The final one is the Blood Thief, who drops Blood Shards when hit and "a whole ton" of them when killed. 2:21 - Goblins now spawn in front of portals, and have new giggles and shouts. They actually try to lure you towards other enemies. 2:21 - Johnny Ebert is up to talk about Adventure Mode. First up are the changed layout for the towns. Also changed are Rifts and Greater Rifts. Rifts are the random mixture of atmosphere, terrain, and monster sets, which keeps things fresh. The problem is, some of the zones from the early days of the project weren't built with this in mind. Looking at Tristram Fields, and how static it is in Rifts. So the tile set has been pulled apart, where a dozen different layouts. 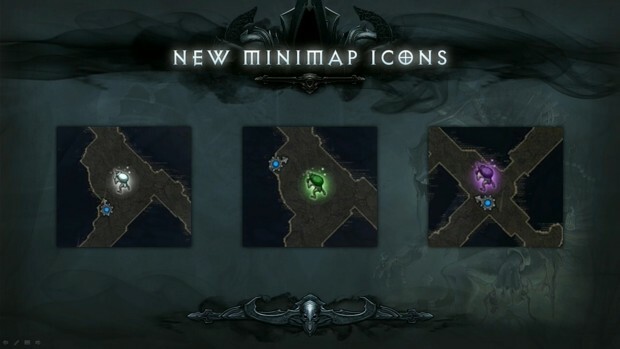 Zones with greater layouts in the next patch will be Oasis, Spider Caves, and Leoric's Jail. 2:26 - Legendary Gems. They add another vector for power, give players more ways to change their gameplay, and create a larger variety of builds. All the gems are getting a decent amount of play. Bane of the Powerful, and Bane of the Trapped and Enforcer take up about half the amount; they want to reduce that. They don't want to nerf, but they hope the as they add new Legendary Gems, they will cut into the use of the most popular Legendary Gems. 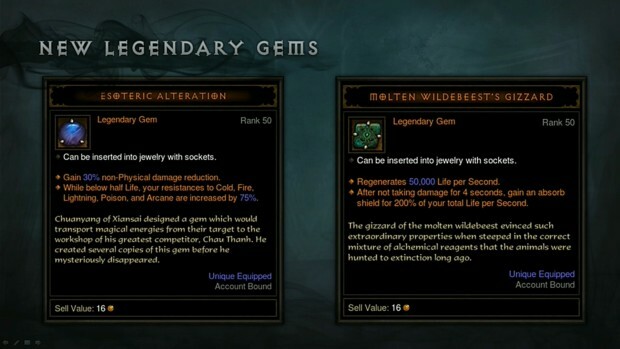 There are 2 new Legendary Gems in patch 2.1.2. These will focus on healing and defense. They are Esoteric Alteration and Molten Wilderbeest's Gizzard. 2:28 - Now Wyatt Cheng is up to talk about changes for Greater Rifts. A big issue has to do with randomness; they feel like randomness is a tool to make the game play playable. They want the game to stay interesting and dynamic with randomness. First up, pylons, more especially the Conduit Pylon. They'd rather figure out why people want the Conduit Pylon so much more than the others. In PTR on 2.1.2 there will be changes to other pylons; Speed pylon will last for a minute, run through Waller walls, and knock up enemies into the air. Shield pylon will be reflect damage, and when it wears off it will do explosion damage on every enemy around you. 2:31 - There will be more pylons in general - between 2-4 pylons per Greater Rift. There will be improved monster density in all Rifts that are low; more elites, more monsters all around. Success or failure should not be based on the monster RNG. 2:32 - All the Rift Guardians will be reviewed. They want to make every one memorable for it's own reasons, with new and interesting mechanics. 2:33 - Also changing is level distribution. The loooooong levels can be boring and annoying if you die. They want to make dead ends not be at the end of a super long hallway. The really big loops can be problematic, so they're getting rid of those too. They still want it random, but not as problematic that way. 2:35 - They're also looking at the inconsistent death penalty, since running far away from a checkpoint is so huge a problem. Something they're going to test on PTR for softcore is an incremental death timer, starting at 5 seconds, 10 seconds, 15 seconds and so on where the hero can spawn at corpse instead of back at the beginning of the level. 2:37 - Season 2 will be on the PTR "soon". There will be changes there. Conquests will be changed; some they like, some they didn't like. The one to get to a high Greater Rift Level will be back. "Reach Level 70" will be replaced, the same reason there isn't one for Paragon Levels, where players just focus on experience. They liked the Conquest of Speed Racer, to get through all the Acts in under an hour. 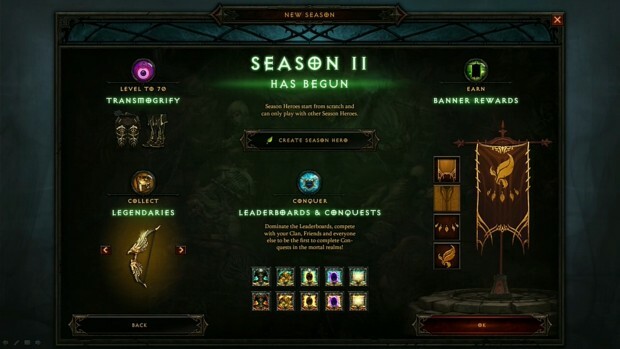 There will be 3 new Conquests coming in Season 2: Avaritia, Worlds Apart, and Language. 2:40 - Also in Season 2 are new transmogrification patterns - for Legs and Boots. And in Season 3 the full set will be completed. 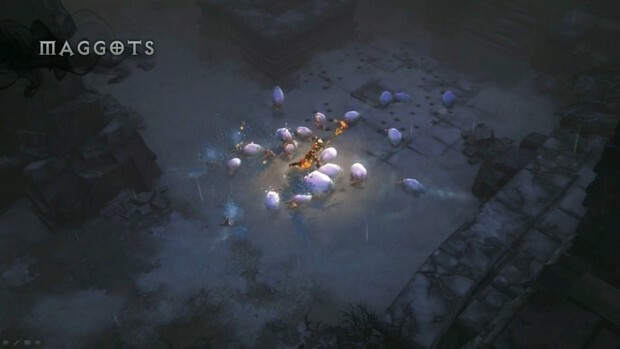 2:40 - New Seasonal Legendary is the staff Wormwood, where "Locust Swarm continuously plagues enemies around you." and it always rolls with 21-25% poison damage. The Locust Swarm is always around you, even without it on your bar. 2:42 - A Wizard season only Legendary is Ranslor's Folly. It has the Legendary power: Energy Twister periodically pulls in an enemy within 30 yards. An enemy can be pulled in this way once every 5 seconds. 2:42 - Next up is Kevin Martens. Coming in 2.1.2 there will be Ancient Items. 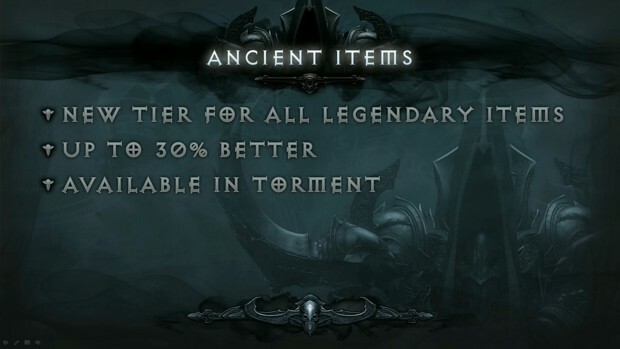 A new tier for all Legendary Items, they are up to 30% better in stats, starting in Torment difficulty with higher chance of Ancient items in higher Torment level. This will apply to all Legendaries, including the new ones. 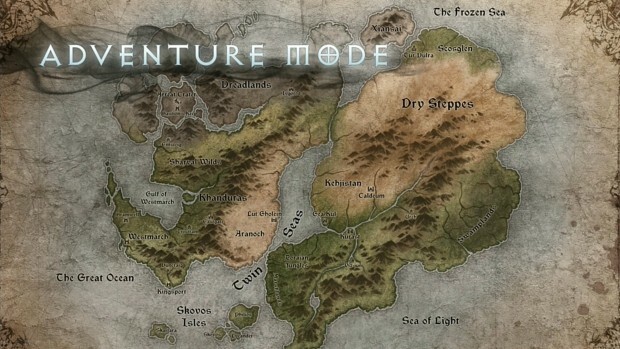 2:45 - There is a new zone in Adventure Mode, near Arreat's Crater in Act III. There are lots of traps, swinging blades and spike traps that you can click to attack monsters around you. 2:48 - New monsters include the Naja Beetles with a spit attack. Frost Maggots are easy to kill but when they die have a frost attack. 2:49 - A new version of the Sand Wasp from Act II are more aggressive, they burst out of glowing nests, and also have a spit attack. 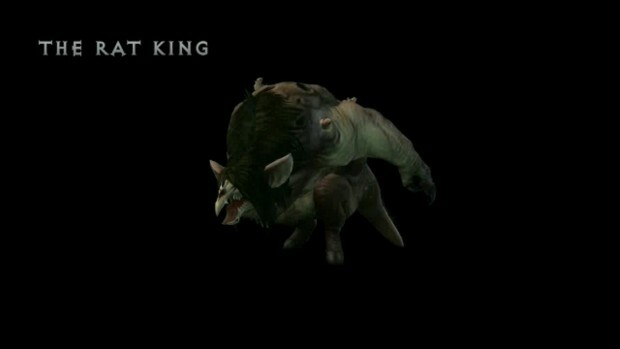 2:50 - One other new monster is the Rat King, "the most disgusting thing we've done." It's a twisted natural creature that was in Sanctuary long before demons became an issue for humans. There are slimy albino rats that pop out of his back as you attack him; when you kill even more pop out. He is a new Rift Guardian, Hamlin the Rift King. If he kills you, he eats the corpse. 2:53 - The town in Act I is changing, everything is close to the portal. 2:54 - 2.1.2 is coming to the PTR very soon. 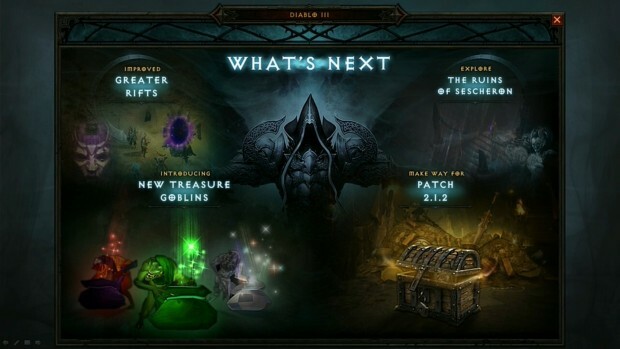 It will bring new Treasure Goblins, Season 2, new Legendaries, Ancient items, and Adventure Mode improvements. 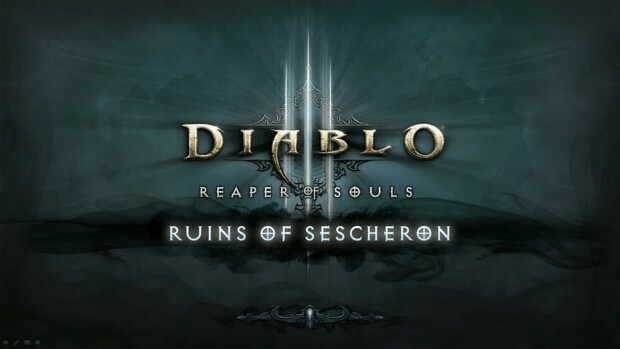 Patches after that will bring the Ruins of Sescheron zone, new monsters, new Legendaries, and more! 2:56 - He's wrapping up now, talking about what is coming up for the Legendary design panel this weekend, and the other panel. Now for a little Q&A! 2:57 - Uber Diablo (like in Diablo II? 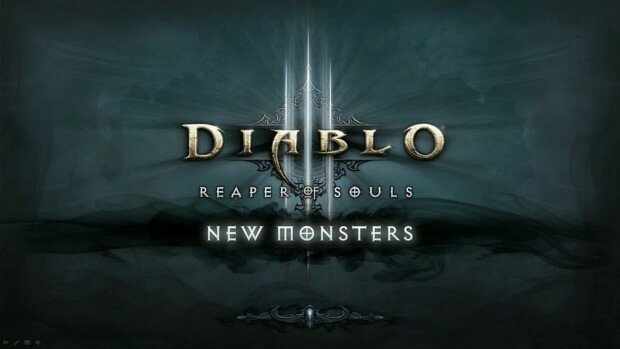 We haven't built one yet, thus far we've focused on new monsters, but it's been talked about. 2:58 - Change the drop color of items? No current plans. 2:58 - End of Seasons, what happens with items in the stash? Everything transfers over, including gold, Paragon experience and characters. All items in stash will be mailed to you. 3:00 - Anything for buying stash space, in a store? Everybody wants more stash space! Not the store aspect, but we talk about stash space all the time. We want to address that eventually. 3:01 - People fish for specific Greater Rift layouts - will these changes fix that? We are looking at that. Zombies are always liked, because they just stand there and don't do much. Internal to the office they're called "paper cut monsters", that don't do much. They're trying to make sure that you aren't getting the same population of monsters every time, but that you are getting a fair mix. That's another axis they're looking at. The monster team is spending some time on the new teams, and some time on the Act IV and Act V that are annoying to fight. Some of that will happen in 2.1.2, some will happen in future patches. 3:03 - Any other new zones? Nothing else to announce at this time. 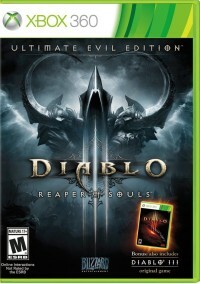 3:03 - Anything for trading, since it's so much a part of the Diablo experience? We will talk a little bit about this at the panel tomorrow. We know there is a social and utilitarian aspect to trading, but it also has the potential to wreck the reward loop like the Auction House did. Right now they're happy with the status quo. There are other forms of trading like they tried on the console like the Nemesis system, that they might expand in the future. 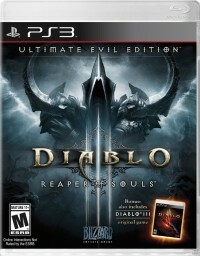 3:05 - Any chance of bringing Seasons to the console version of Diablo III? A lot of console players aren't online, so we had to allow that offline. As soon as you do that, it wrecks the integrity of anything like leaderboards. We're always looking to improve the console game. 3:06 - Is there any way to have Adventure Mode locked when you started the Season? We're going to leave it that way for Season 2. We might have specific lore books only in Campaign Mode. We don't want to have people to spend too much time in Campaign Mode, though. 3:08 - Another expansion? We can't answer that, but we will definitely bring awesome stuff in patches. 3:08 - Will Trial Rifts be changed? Changes to Trials are coming, they will be on PTR. The pacing and monsters of Trails will be looked at; all of them will be able to be moved, like with vortex. They want to make sure it's a more consistent progression all the way up. 3:10 - How rare are the new Ancient Items? The Ancient Items are very much for people who are really into completing sets. The idea is to have something to go for after getting the 6-piece set. The current idea is about a 5-10% chance of any Legendary or Set item to be an Ancient Item. It could start at about 1.5% at Torment I, and go up from there; higher levels of Greater Rifts will also give increasing chance of those dropping. 3:12 - Any idea for an item creation system like Diablo III runes system? A lot of the crafting system is there to capture that spirit. The rune system in Diablo II had you more excited about the components dropping. Right now it doesn't feel like any of the Legendary parts were really rare. They tried it with the Legendary component, but that didn't work well. They didn't like the rune system because it required having a lot of arcane knowledge, that would have to be found elsewhere. They'll be looking at other ways to capture that spirit. 3:13 - What about balancing builds like Demon Hunter M6? That will be answered at the panel tomorrow. That's it for the panel! 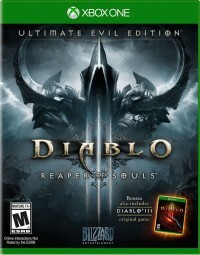 We'll have a livestream from the panel tomorrow, as well as covering other Diablo III news from BlizzCon as it arrives.